The expedition criteria “that we should drive from Cape Town to Cape Horn” and our experience in Alaska the previous January left me in no doubt that a Land Rover was the most suitable vehicle. Land Rovers have shortcomings; comfort, speed and security to name but a few but these are far outweighed by the rugged construction, renowned off road performance, durability, provision for P.T.O and auxiliary hydraulics and the ability to waterproof the major components with readily available military kit. This doesn’t take into account the pedigree, its history of expedition work around the world and of course my own preference. 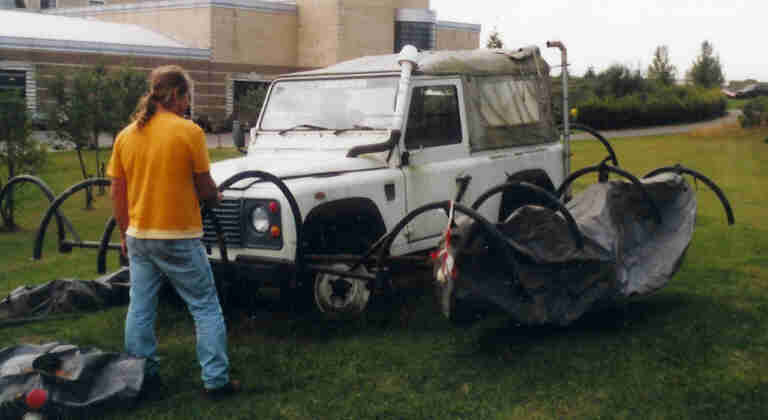 I was aware of the SΙΙA Air portable in the Dunsfold collection with a pair of floats attached to the side and by accident I found the Land Rover SV Amphibious 90 round the back of the Heritage Motor Museum at Gaydon. This 90 was built in 1989 and used to promote Land Rovers Sponsorship of Cowes Week and simultaneously launch the then new Discovery. I sought permission from museum curator Steve Laing to re-assemble this on the lawns surrounding the museum. This Land Rover has now been painstakingly restored by Stuart Baldwin of Hebden Bridge. In a brief conversation with Dave Saunders who headed the team that built it I learnt that little attention was given to research and development they “just built it and it worked “ type of situation. I concluded that I should therefore be able to improve the design. 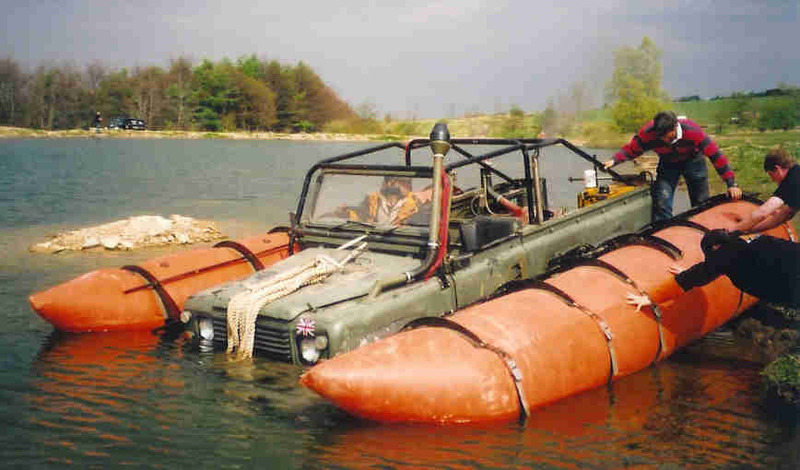 I noticed that with the floats fixed to the sides, the position of the Land Rover in the water was determined by its displacement. 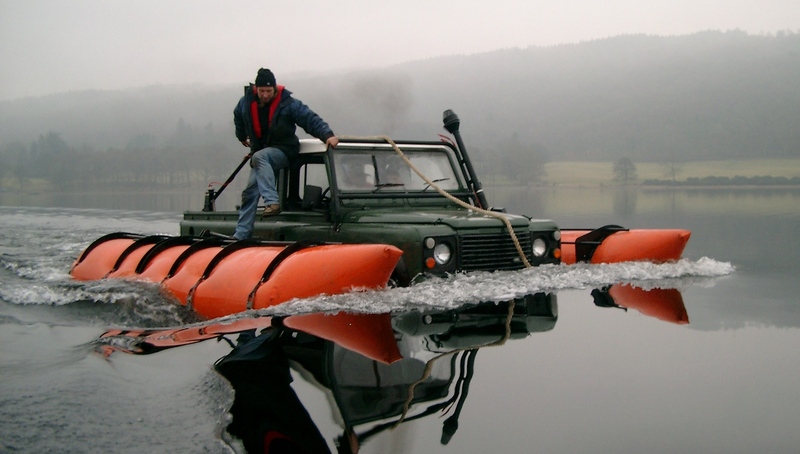 If the floats were set too high the Land Rover would travel low in the water; to set the floats low enough to enable it to ride higher in the water and you would not have enough ground clearance before entering the water. It would make sense therefore to make the floats height variable. Enquiring within the boat / sailing community with few exceptions was extremely negative. 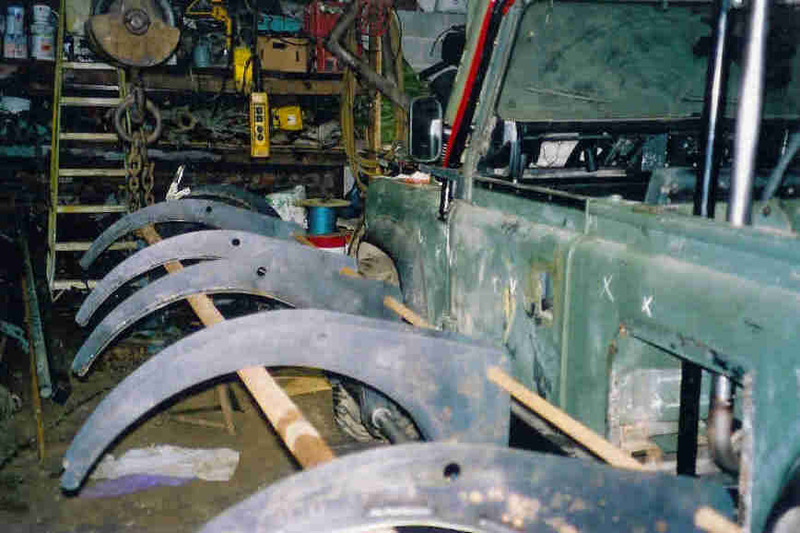 Trying to explain that you want to try and make a Land Rover float was met with a resounding “No you can’t do that” or “No that won’t work” – to those boatyards and marinas who took the time to listen and offered constructive advice I am extremely thankful. Having established what I wanted to achieve I took the idea to Dan Evans of Evans UK. Over a period of some 15 months we calculated, made mock-ups, models and drawings and we, encouragingly, finished up with a propeller driven Land Rover capable of exceeding 5 knots on virtually its maiden voyage. 1) Streamlining the body / hull. 2) Maximising thrust at the propeller from available engine h.p (reducing cavitation). 3) Explore the use of lightweight materials and components for use in the construction of the actual expedition vehicles. We will continue to develop what we have and proceed with confidence towards sea trials.